The Cape Hatteras Lighthouse is located on Hatteras Island in the Outer Banks in Buxton, North Carolina. It's made of brick and stands 208 feet tall. The Amish-Made Wooden Cape Hatteras Lighthouse is a lovely replica, handmade with solid wood and lots of custom features to create a look you'll love. 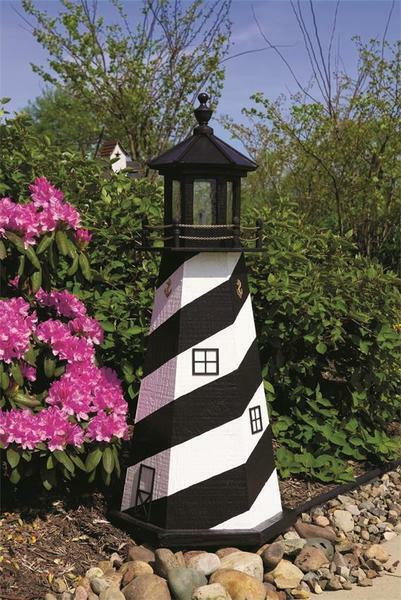 Add lighting and nautical decor to your outdoor scene with an Amish made lighthouse. The Wooden Cape Hatteras Lighthouse features a spiral desgin and comes in the colors you choose. DutchCrafters offers a wide variety of lighthouses with custom options. They make a great gift and addition to outdoor decor. Create the perfect lighthouse today. Order online or email or call a Furniture Specialist for assistance. Thank you for shopping with DutchCrafters. Please Call for Custom Color Combinations. Additional Charges May Apply. I want to take this time to personally thank you for your immediate attention to my request. Specifically, I asked if there was any way to expedite my order (ID:50767) which was just placed on Monday, August 17, 2014. The lighthouse was a birthday gift to my sister and I wanted her to have it before August 29, 2014. I learned today, my sister received the gift this afternoon! Wow! Thank you so very much. You have made my day. Your efforts are much appreciated.